Outback allied health professions with the Centre for Rural and Remote Health, James Cook University, North West Hospital and Health Service, Gidgee Healing, NWRH, Department of Education and private practice invite you to a biennial forum to progress and support Allied Health practice in the outback. "Realising potential and inspiring change"
Join with allied health practitioners and services from outback Queensland and cross border regions of the Northern Territory to network and share your allied health innovative projects, practice, education or service models, research and programs. This forum will provide allied health practitioners with the opportunity to build on the inaugural theme of 'Realising potential and inspiring change'. The call for abstracts has closed. Registration is now open. Travel bursaries available through Health Workforce Queensland: For more information, click here. 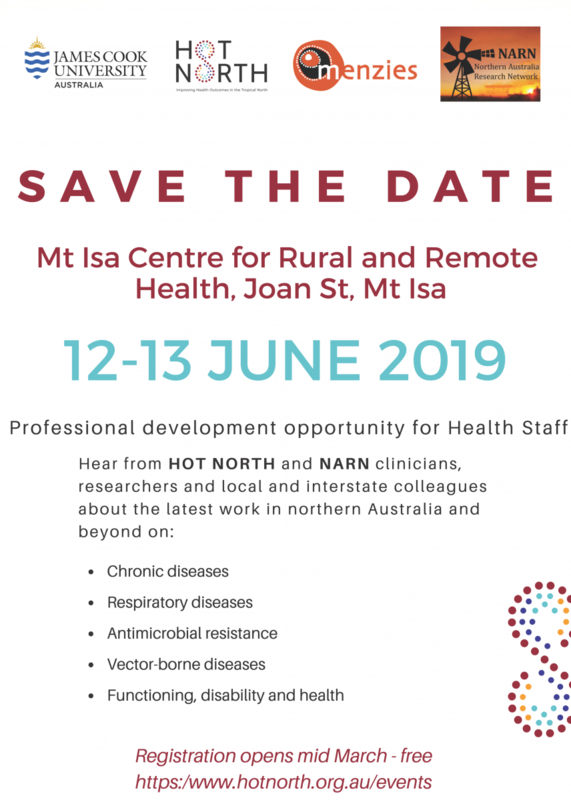 The Outback Allied Health forum will be followed by the HOT NORTH and NARN professional development workshop.